Many people ask for a good book on Out-of-Body Experiences or Astral Projection. It depends on what you're looking for, right? It's a tough question because each OBE book has a different angle. I haven't updated my Top Ten OBE Books list since November, 2014, so I'm long overdue. This time, I'm going to break it down into categories. 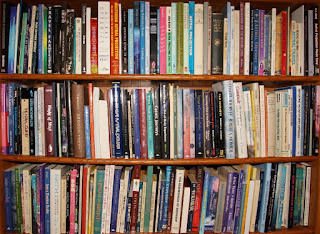 Many of the books listed are links to book reviews from my blog, so click on them for a full book review. Disclaimer 1: I own a lot of OBE books, and have read almost all of them. Unfortunately, for some of them it's been too many years. If I don't remember a book, I didn't include it in the list. That doesn't mean it's not good; it just means I don't remember. Eventually I plan to re-read them all, time permitting, and then I might need to adjust the list. Disclaimer 2: Some books fit into multiple categories, and it was sometimes hard to choose, but I only wanted to list one book per author. Astral Dynamics Robert Bruce Lots of good techniques and advice. Stresses energy work. Adventures Beyond the Body William Buhlman A well rounded balance of info, theory and a variety of techniques. Navigating the Out-of-Body Experience Graham Nicholls A good assortment of creative OBE techniques and general OBE info. Travel Far Darryl E. Berry Jr. A well-rounded book with general information and techniques. Leaving the Body D. Scott Rogo An oldie but goodie. Techniques and OBE advice abound. Out of Body Experiences Akhena OBE Information, techniques, advice, excellent narratives, and validation. Out of Body Experiences Robert Peterson General information, narratives and exercises after every chapter. These books include general information about OBEs, speculation about what is "out there" and often contain some techniques and pointers. Explorations In Consciousness Frederick Aardema One of the best and yet underrated OBE books. Creative and informative. The Projection of the Astral Body Sylvan Muldoon and Hereward Carrington A Classic from the 1920s, but still very much relevant today. Journeys Out of the Body Robert Monroe The book that got me started. A classic in the field. Powerful. Out-of-Body Exploring Preston Dennett Good solid OBE information. Demystifying the Out-of-Body Experience Luis Minero Solid information. Brings the subject down to Earth. Exploring Your Inner Reality Jonas Ridgeway Nice. Good solid info and OBE advice. Astral Projection Oliver Fox Another classic from an early pioneer in the field. Out-of-Body Experiences Janet Lee Mitchell, Ph.D. Chalk full of good information. It's been many years since I read it, but I remember it was good. These books are more geared toward telling the personal stories of those who have had out-of-body experiences, although light on techniques. Multi-Dimensional Man Jurgen Ziewe Moving, touching, inspiring. A heart-warming ride into other dimensions. Still my #1 favorite OBE book. The Out-of-Body Experience: An Experiential Anthology Edited by Rodrigo Montenegro A great collection of OBE narratives, many of which have validation. Astral Projections Michael Ross Small, but well written and heart warming. The Study and Practice of Astral Projection Dr. Robert Crookall Lots of good stories and speculation about their meaning. Soul Traveler Albert Taylor It's been a long time since I've read it. The Astral Projection Guidebook Erin Pavlina Amusing and well written, although a little far-out. Persephone's Journey Vicky M. Short A heart warming journal of personal growth and out-of-body travel. Loved Mary Deioma A touching personal journey. These books are for proponents of The Monroe Institute and Focus Level Experiences. Voyages Into the Unknown Bruce Moen Moen's whole series is good. Soul retrieval in the Monroe Institute tradition. Cosmic Journeys Rosalind McKnight It's been a while, but I remember it was good. My Big Toe Thomas Campbell I've never read it, but it comes highly recommended. I do own a copy. Big. These books were written for the scientific, and often skeptical, person. With The Eyes of the Mind Glenn Gabbard and Stuart Twemlow Compares OBEs to body boundary disturbances like autoscopy and schizophrenia. Fabulous. Highly recommended. Beyond the Body Susan J. Blackmore A parapsychologist's view of OBEs. Level headed, although she became quite an outspoken skeptic in later years. Flight of Mind H.J. Irwin Scientific and very dry, but very informative. Out-of-the-Body Experiences Celia Green It's been a long time, but I remember it was good. These books are geared toward practitioners of western esotericism, magic and the occult. Between the Gates Mark Stavish Some good solid out-of-the-box thinking and techniques on OBEs. Soul Flight Donald Tyson I don't remember much about it, but Tyson's books are always solid. Astral Projection, Ritual Magic and Alchemy S.L.Macgregor Mathers I own it, but I don't think I've ever read it. Techniques of High Magic Francis King & Skinner I don't think I've ever read this one either. These books are written for practitioners of Wicca, Druidism, and such. I've never been a fan of these, but I didn't want to discriminate against them either. The Llewellyn Practical Guide to Astral Projection Melita Denning & Osbourne Phillips Maybe the second OBE book I ever read, in 1980. Flying Without a Broom D.J. Conway Talks about astral lovers and such. Astral Projection for Beginners Edain McCoy I don't remember much about this book, to be honest. 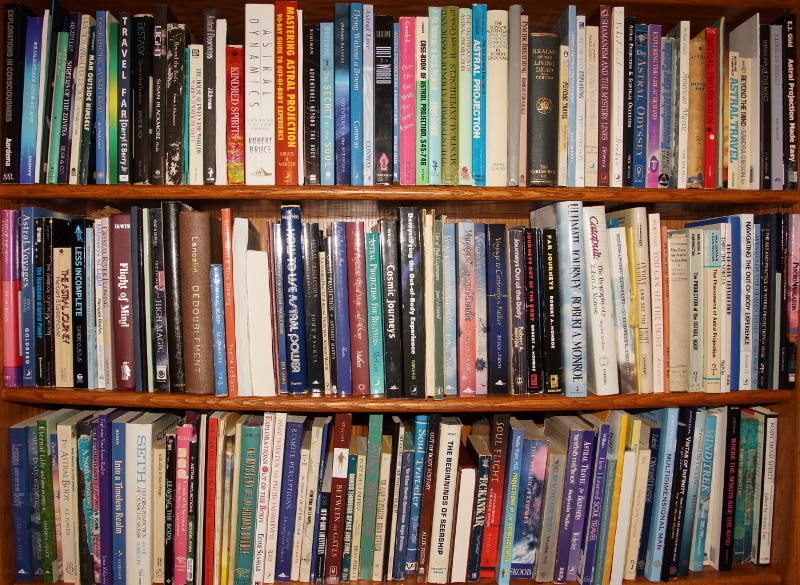 These books are purely fiction; novels that have OBEs as a primary theme. I'm sure there are more OBE-based novels, but I'm a nonfiction guy, so I don't focus on them. I have read and enjoyed every one of these, though. The House Between the Worlds Marion Zimmer Bradley A parapsychologist's OBEs lead to incursions from another dimension! Love this book. Got Anteril? Kindred Spirits Alan Brennert An OBE love story: Alan Brennert also wrote touching tales for The Twilight Zone. Flying in Place Susan Palwick If I remember correctly, the main character uses OBEs to escape from her sexual abuse. Nightflyer Christopher Fahy A teenage boy uses OBEs to get revenge on bullies at school. Maybe not uplifting, but definitely fun. Of course, OBE books can only take you so far. I hope you explore the state yourself. Thank you Bob for the time you put in to read books and post! I find it very helpful...I found a few books to grab'n'read! It's very helpful to see all these books in one place.I have read several of them but I see here many more to read. Thank you Bob! What do you think about Far Journeys and Ultimate Journey of Robert Monroe? Do you have similar experiences? And another question. Do you know 100% always working OBE method?